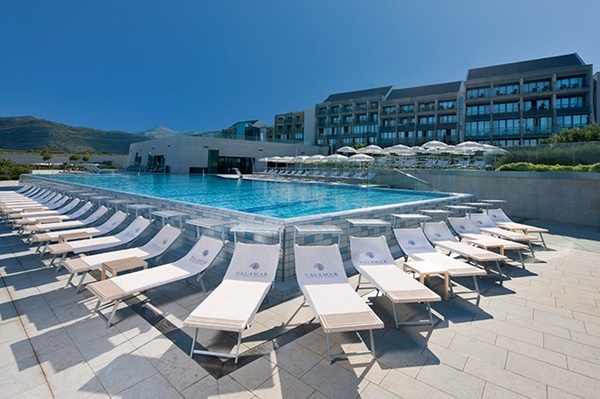 Valamar Lacroma Hotel is the largest conference and spa hotel in Dubrovnik boasting of a 1200 conference capacity. In the heart of the resort there is a huge conference centre designed especially for conferences, presentations, seminars and exhibitions. Hotel Valamar Lacroma Dubrovnik is situated on the Babin Kuk peninsula, 5 km from Dubrovnik's Old Town. It offers comfortable rooms with beautiful views of the Elaphite islands. This hotel offers accomodations in 385 air-conditioned, well appointed contemporary guest rooms. Room amenities include air-conditioning/heating, en-suite bathrooms, satellite TV, mini bar, safety deposit box, hair-dryer, additional toiletries and cosmetics, tea/filter coffee machine, iron/ironing board, direct dial phone, DVD player, Wi-Fi Internet access (surcharge). Valamar Lacroma serves Mediterranean and international cuisines in its buffet restaurant (Lacroma restaurant) and elegant à la carte restaurant (Langusto restaurant). Guests can enjoy drinks and snacks at the Orsula lobby bar, Palma lounge bar and Onofrio pool and wine & cocktail bar. Guests can relax on the of the nearby Valamar Dubrovnik President hotel. Those looking for action can choose from an exciting range of activities such as sea-kayaking, scuba diving, windsurfing, snorkelling. Valamar Lacroma Dubrovnik has two outdoor pools (one for adults and one children's pool) bordered by fragrant gardens and a spacious sunbathing terrace. Deck chairs, beach umbrellas and towels are available for use. There is also an indoor swimming pool. Wellness offer include: spa, afrodita spa (ladies only), vitality zone, indoor and outdoor swimming pools, cardio fitness, executive spa, ragusa treatments, ragusa rituals, ragusa beauty packages, ragusa spa memebership and ragusa spa information. Facilities in and around the hotel provide endless opportunities to enjoy an active vacation. Sport options in the hotel include cardio fitness with 15 different items of equipment. Sport options in the vicinity of the hotel: volleyball, beach volleyball, handball, badmington, bowling, basketball court, tennis court, walking and jogging paths, diving school, parasailing, water skiing, kayaking, banana boat rides, pedal boats, aerobic. The Valamar Lacroma Dubrovnik is the largest conference centre in Dubrovnik with the capacity to host 1 200 delegates in a multi-purpose conference hall and seven additional meeting rooms. Valamar Lacroma Hotel is situated in touristic area of Babin Kuk which is around 3 km away from the Old Town. If you are arriving to Dubrovnik by plane and taking a shuttle bus from the airport you should get off the bus at Pile Gate. From there take either local bus no.5 or no.6 and drive it until you reach Babin Kuk III bus stop. Hotel is situated a 5-minute walk from there. For those guests arriving by car, hotel has its own parking space next to the hotel (fees aplicable).